A new month and a new Comic Block! I guess if I do more than one of these unboxings I’m going to convince myself I need to do them every month. 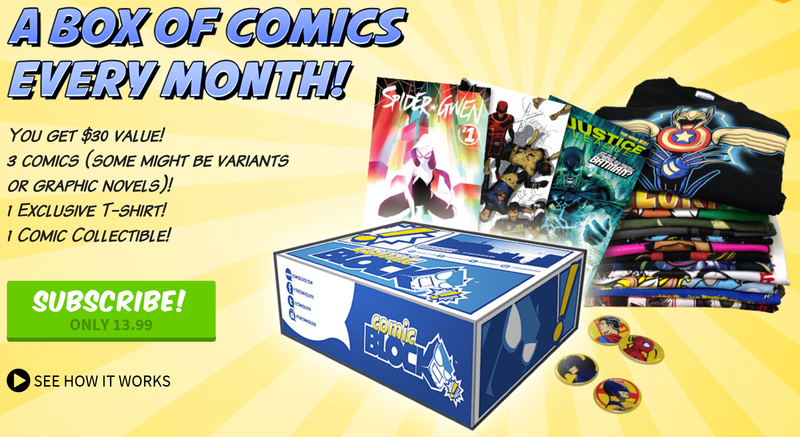 The slightly odd thing about these Comic Blocks is that because they ship at the end of the month you don’t actually get June’s box until July so the month constantly seems off. It’s not that big of a deal I just don’t want the internets to feel I waited a whole month to post this, the box just came in the mail this week. Here is a look at the insert that comes in that box that explains all the items. This month every comic book was an exclusive Variant cover instead of 2 out of 3 from the May Comic Block which is awesome. Still no sign of the elusive trade paper back that we were promised would be in some of the boxes, so perhaps next month? The overall quality of comic books remains very high. The issue of Groot and 21st Century Tank Girl justify the purchase price of the box alone in my opinion (sorry Ghostbusters). It looks like the trend will be that all the comic books are number 1 issues of new ongoing series which is awesome. They are trying to get people on board new series rather than handing out random overstock back issues. We’ll start by taking a look at the non Comic Book items in the box. This month had a cool Batman vs. Superman T-Shirt which I like a lot more than I did last month’s Comic Book Guy T-Shirt. The box also came with a Avengers Pen and note pad which looks like something you’d find on the shelf at Wal-Mart or Target and is pretty meh. I would have rather they included an art print like they did last month then have something so generic as this pen. Last month I posted my unboxing before I actually read the books so I thought it might be better this month if I read them first and wrote a little blurb about each one. As Rocket famously stated, Groot “Don’t know talkin’ good…, so his vocabulistics is limited to “I” and “am” and “Groot,” exclusively in that order”. So when Marvel announced they were going to release a Groot solo ongoing series I was curious how it would turn out. While this may be a Groot solo series, Rocket is just as much a star and does the heavy lifting in the speech department. 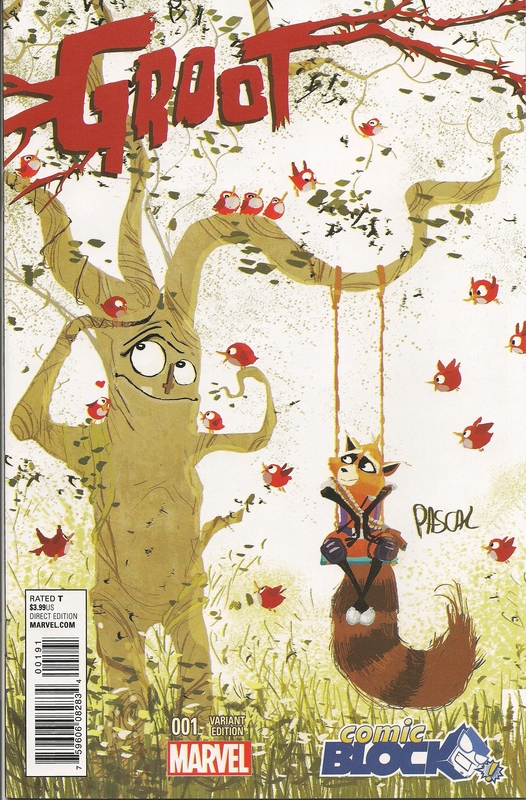 However, the end of this issue makes me think that Rocket and Groot won’t actually be with each other going forward like they were in this issue. This comic was great. It had the humor and wit that the Guardians of the Galaxy Film brought and was a joy to read cover to cover. I’m still not sure I’m going to pick up Groot as an ongoing series but I will definitely be keeping an eye out for it to start appearing on Marvel Comics Digital Unlimited. My favorite part though had to be this little reference to Man of Steel. This is actually the book I was most exciting about. 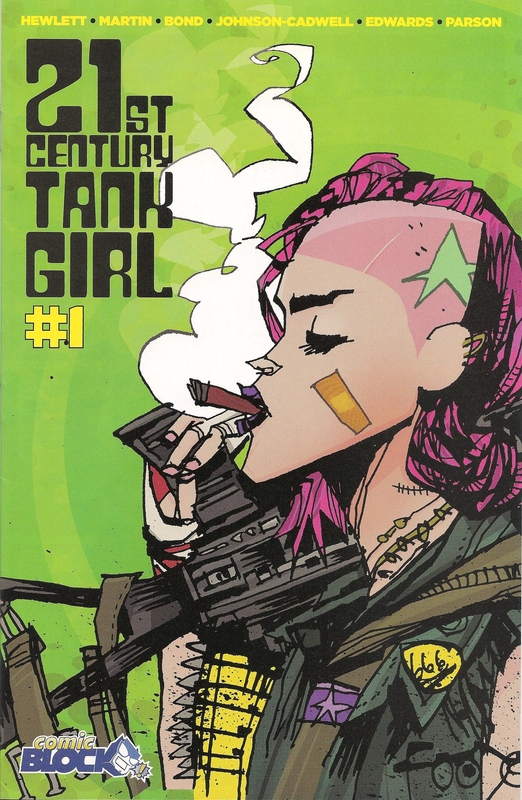 I don’t know much about Tank Girl so it was pretty sweet to find an issue in this month’s box. This issue (and series I’m assuming) is an anthology issue so it had 4 different stories with various writers and artists in it. All the stories were funny, raunchy, and violent. I don’t know if I will add this to my pull list but if future issues are in this anthology format this it will be good to know I can pick them up later and not be lost. This is the comic that I was least excited about in the whole bunch. In general I am pretty weary of comic books that are based off of TV Shows or Movies. I’m sure that there are plenty of good books out there but it just isn’t my cup of tea. That being said this comic was ok. I’m not going to buy more of the series, but I enjoyed the issue well enough. 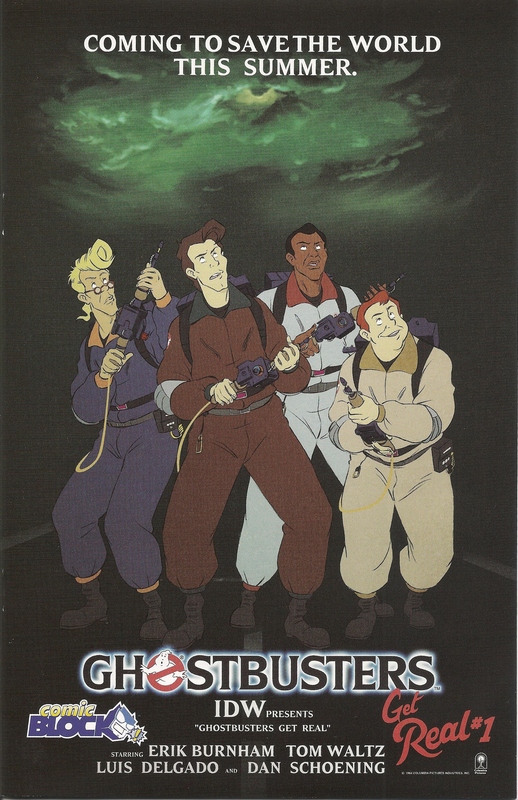 The plot is that the elder God Proteus attacks the Real Ghostbusters (from the 90’s cartoon) causing them to go into the universe of the regular Ghostbusters. I am vaguely aware that the Real Ghostbusters existed and that it is different from the normal Ghostbusters so I was able to understand that part. They give you all the information you need anyway so even if you aren’t familiar with the intricacies of Ghostbusters you would be able to follow along. The target audience for this book is for children around 8 to 12 so if you got a kid that is into Ghostbusters this might be a good pick for them. Full disclosure I was not paid for this post and bought this comic block with my own money. I am doing this unboxing for my own entertainment, however, if the people at nerd block wanted to give me free things I would love to take them and review them here. 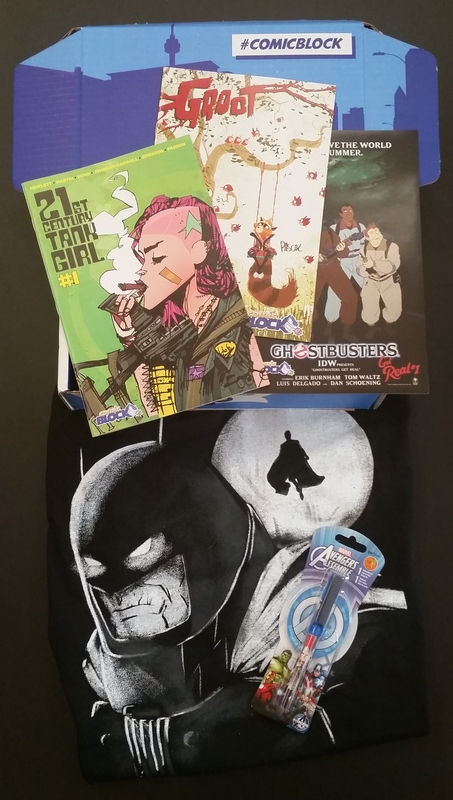 Every month I get my Loot Crate or Nerd Block my natural instinct is to do an unboxing post. However, by the time I get to it I generally find there are already hundreds of posts and pictures out there days before my box even arrived. 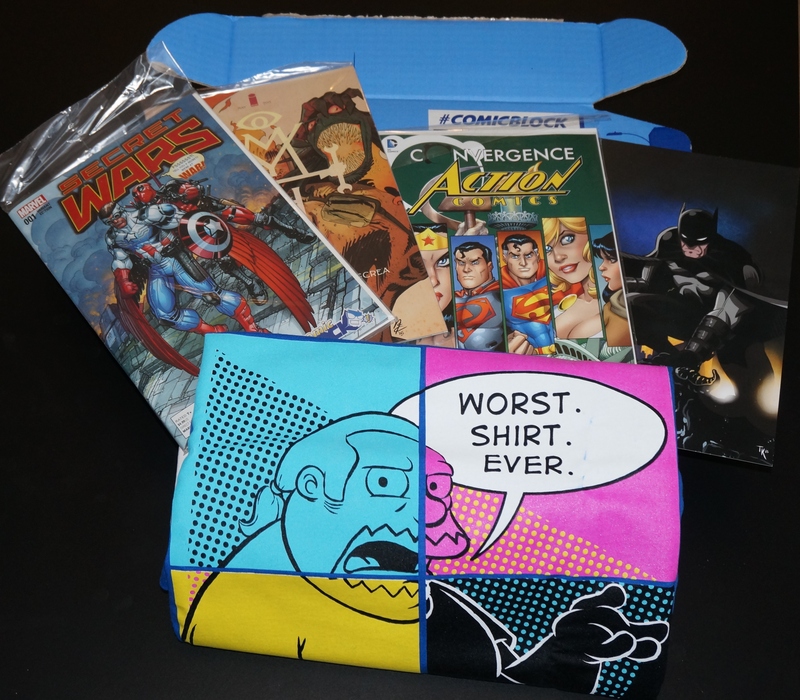 Well in May I decided to try Nerd Block’s newest subscription box, the Comic Block. I got the e-mail notice that it was shipping last week and have been searching online to see if anyone else online had gotten their Comic Block box ahead of me. I couldn’t find anything, no unboxing pictures, no blog posts, nothing. So I have taken it upon myself to do my own unboxing post. Here is the beauty shot. I even did my best to arrange things so I could get the Comic Block Hashtag in the picture. Inside there was a card that had all the items in the box with a short description.